Buckwheat is thought to have originated in China but it most often appears in recipes from Russia, France, and Japan for pancakes, blinis, crêpes, and soba noodles. Other than being used in pancake mixes, buckwheat isn't much of a mainstay in recipes in the US. That's too bad because this unique GF food tastes great and can really boost the nutritional value of gluten-free recipes. Buckwheat can be purchased as groats (hulled whole buckwheat), as kasha (toasted buckwheat groats), as dark milled flour and as light milled flour. Dark buckwheat flour contains bits of the dark buckwheat hull and has a much more pronounced, earthy flavor than flour milled from hulled groats which have a mild neutral flavor. Food scientists have discovered that buckwheat is a rich source of what is called "biologically available protein." This means that buckwheat has a well-balanced assortment of essential and non-essential amino acids, the building blocks of protein. It is considered a superior source of protein when compared to wheat, rice, and even millet. 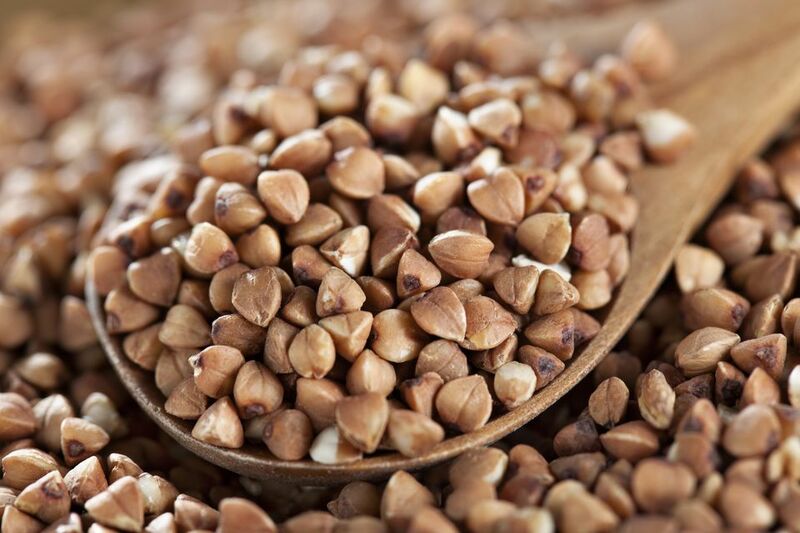 Like citrus fruits, buckwheat is a rich source of rutin, a powerful flavonoid antioxidant. It's also is a good source of Vitamin E, another powerful antioxidant. Antioxidants prevent cell damage and support good health. A gluten-free flour that's high in antioxidants is a real bonus! By replacing a portion of rice flour in gluten-free recipes with buckwheat flour, gluten-free recipes become a better source of essential minerals. Soluble fiber is a type of dietary fiber that holds water like a sponge. It forms a gel that is responsible for slowing the time it takes food to travel through the digestive tract. It supports the healthy digestion and absorption of nutrients in food. Soluble fiber also slows the absorption of glucose which supports healthy glucose metabolism and also is known to lower blood cholesterol levels. One cup of hulled buckwheat cereal contains about 4.5 grams of fiber. In comparison, 1 cup of oatmeal contains about 3.96 grams of fiber. The best reason to add buckwheat to gluten-free recipes is to improve the nutritional quality of your diet. Buckwheat is high in quality plant proteins, antioxidants, soluble fiber, and minerals. Use whole dark buckwheat flour to make earthy gluten-free buckwheat crêpes and gluten-free pancakes. Use light buckwheat flour to replace up to half the rice, bean, sorghum or soy flour used in gluten-free recipes for cookies, muffins, rolls, and bread. Gluten-free English muffins are a good example of a recipe in which a portion of the total gluten-free flour blend was replaced with light buckwheat flour with great results. Light buckwheat flour also works extremely well as a thickener for soups, stews, and sauces. Buckwheat groats are milled by hulling the whole buckwheat kernel and lightly crushing it. Groats can be served as a hot cereal or used to grind homemade light buckwheat flour. Kasha is made by toasting buckwheat groats. Toasted kasha has a delicious nutty flavor. It can be used in granola recipes, served as a hot comforting cereal or as an Easy Kasha Side Dish.